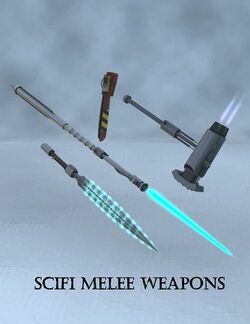 Scifi Melee Weapons is a set of four science-fantasy weapons: Jet Hammer, Chainsaw Gauntlet, Electro Sword, and Beam Glaive. It is available from DAZ3D, either as a paid item on its own or for free as part of Daz Studio 4 Pro or the Sci-Fi Warrior Bundle. This page was last edited on 28 October 2017, at 00:21.